The regiment was formed in the summer of 1862 and included men from Marshall, Gilmer, Livingston and the counties of Smith and Upshur. It was assigned to H. Randal's, Maclay's brigade, Trans-Mississippi Department. It fought at Jenkins' Ferry, Ark. It was stationed at Shreveport, La. and later Hemstead, Texas. It disbanded prior to the June 1865 surrender. 1. THOMAS WILLIAM5 ARNOLD (MARTIN4, WILLIAM3, JOHN A.2, JAMES1)1 was born 28 Mar 1835 in Mcnairy County, Tennessee, USA, and died 26 Jun 1911 in Smith Co., Texas. 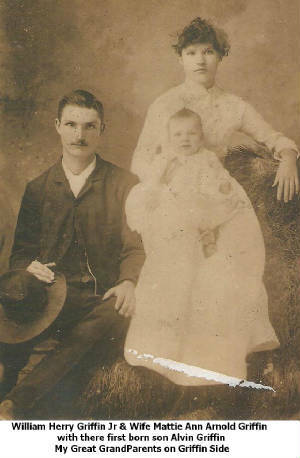 He married ROSANNA (ROSA) MASON 21 Dec 1859 in Smith Country, Texas, daughter of ANDREW MASON and MELISSA WHILELEY. 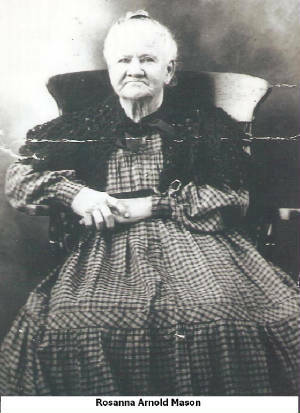 She was born 21 Aug 1838 in Indiana, and died 24 Oct 1927 in Arp, Smith Co., Texas. i. NANCY6 ARNOLD, b. 1861, Texas. ii. LOUSIA IVA ARNOLD, b. 16 May 1864, Texas. iii. LAVENIA CLEMATINE ARNOLD, b. 15 Sep 1867, Texas. iv. MARY MOLLIE ARNOLD, b. Mar 1870, Texas. 2. v. MATTIE A ARNOLD, b. 25 Oct 1872, Texas; d. 04 May 1941, Texas. vi. MARTHA ANN ARNOLD, b. 25 Oct 1872, Texas. 3. vii. WILLIAM MARTIN ARNOLD, b. 17 Mar 1874, Texas; d. 07 May 1949, Smith Country, Texas. 4. viii. JAMES ELDREDGE ARNOLD, b. 16 May 1875, Texas; d. 17 Jan 1966, Arp, Smith, Texas. 5. ix. ETTA L ARNOLD, b. 26 Mar 1875, Smith Country, Texas; d. 24 Feb 1936, Smith Country, Texas. 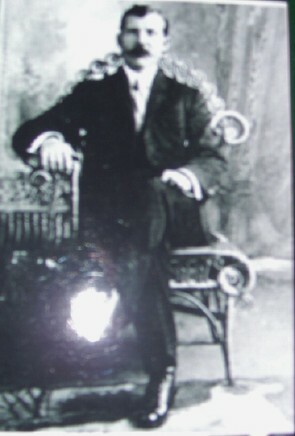 x. ROBERT HENRY ARNOLD, b. 12 Feb 1880, Texas; d. 31 Aug 1918, Texas. 6. xi. 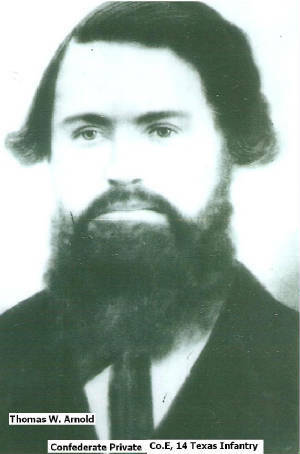 JESSIE LONNIE ARNOLD, b. 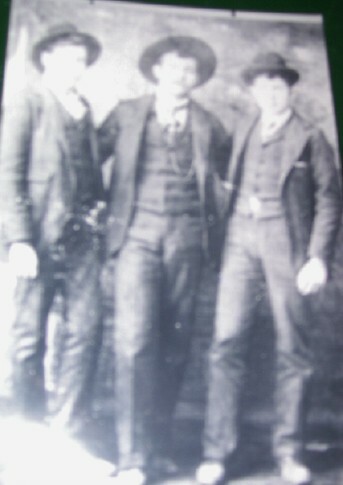 03 Aug 1882, Texas; d. 12 Sep 1921, Smith County, Texas. xii. EDWARD ARNOLD, b. 25 Nov 1883, Texas; d. 10 Sep 1934, Smith Co., Texas.